Please go to www.vrbo.com/26158 to see the recent guests review of their stay at the property!!! complexes that are located in DESTIN's Crystal Beach area. Destin.You will find lots to do both day and night. keep to yourself yet can't stop to talk about. waves not the passing traffic! courses. Don't gorgeous a trip to the Silver Sands outlet mall!! bunks for 2 and a queen size sleeper sofa in the living room area. yet minutes away from all the day and evening attractions. Full kitchen, diswasher, washer/drier, linens provided, Cable, Flat screen TVs, Stereo,DVD Player, pool( heated seaonally ), jacuzzi, Gas BBQ, private beach and access and many more!!!! Good location. Outdated and small condo. Pros: Great location in Destin. Very close to many restaurants and shopping. Very short walk to be on the beach. Good views. Basic amenities are present (dishes, cooking utensils, appliances, etc). Ample parking. Owner is very responsive to questions and needs. Cons: condo is older and small. Rust is on the metal in the condo. Everything is basic and/or low-grade (appliances, deck furniture, fixtures, etc). Furniture is older and needs replacing. Carpet is very worn and needs replacing. It just felt somewhat 'dirty'. It was also humid in the unit even with the air conditioner running - which probably explains the rust (and, no, we didn't leave the deck door open). With it being an older condo building the hallways and rooms are small and hard to walk through easily (and I am a skinny person). I would probably not stay here again as I feel the cons outweighed the pros. I appreciate you taking the time to give me feedback about your stay at the property. All guests are required to give me a brief inspection report of the condo upon arrival( sent email with contract). As everybody's expectations vary of the condo, would like to accommodate each and every one of guests while they are vacationing. Having said that , I don't remember getting an as such report from the guest, otherwise I would have loved to address those issues in a timely manner. The condo is of standard size 1BR 1.5BA , all units at the property are the same size ,accommodating 6 ppl. If you were meticulous about certain sizes, you could have asked me of the size. Unsure where the rust location is? As maintenance failed to identify it. The carpet is not older than a year, due to heavy traffic in the unit it gets shampooed every 3 months, had she requested it be cleaned, it would had been done without being inconvenienced to her. However, the cleaning crew went in to inspect it , even though they disagreed, i went ahead and had it shampooed due to the comment above. The entire unit and furniture were renovated 3 yrs ago, upgraded a year earlier including the kitchen appliances in its entirety. 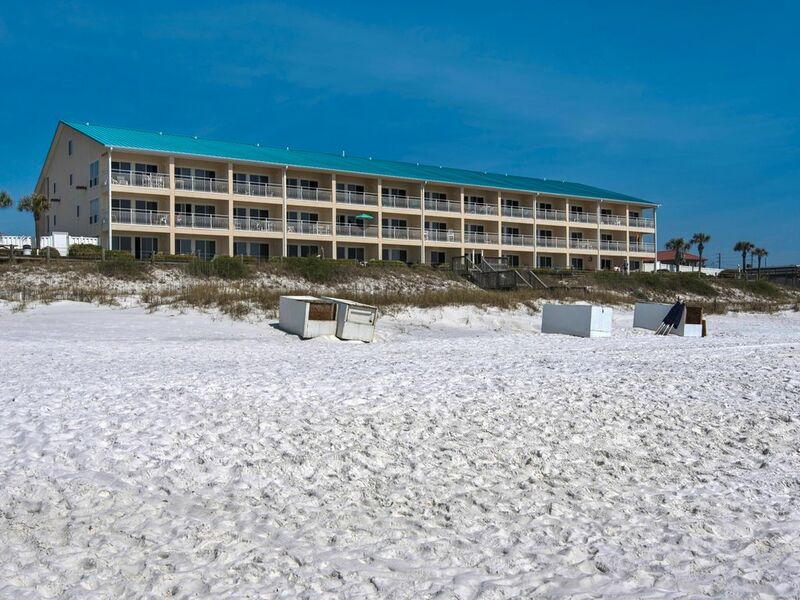 The property sits directly on the beach. Its common that guests leave the patio door open which causes condensation of the air-ducts that gives off the moldy smell. I had maintenance inspect the entire unit after receiving the comments as above , yet there was no evidence that there was mold issue in the unit. Hopefully this letter would help future guests understand most of the above mentioned issues would have been addressed, had i been contacted immediately. All rates are subject to cancellation without notice.